When visiting a local grocery, I noticed store pre-packed bags that could be purchased by the shopper and then donated to the local food shelf. Great idea, but the pre-packed bags did not contain the healthiest foods. So I thought, “we can do better than this,'' and brought the idea of creating healthier donation bags to the Food Shelf Nudging Team comprised of SNAP-Ed educators and Kelly Kunkel, an Extension educator. 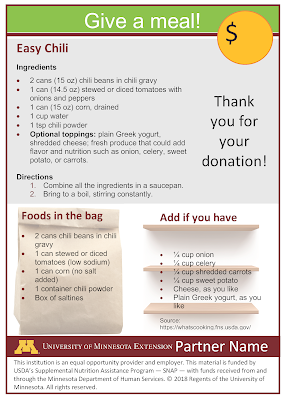 Template for Give a Meal bag flyer. 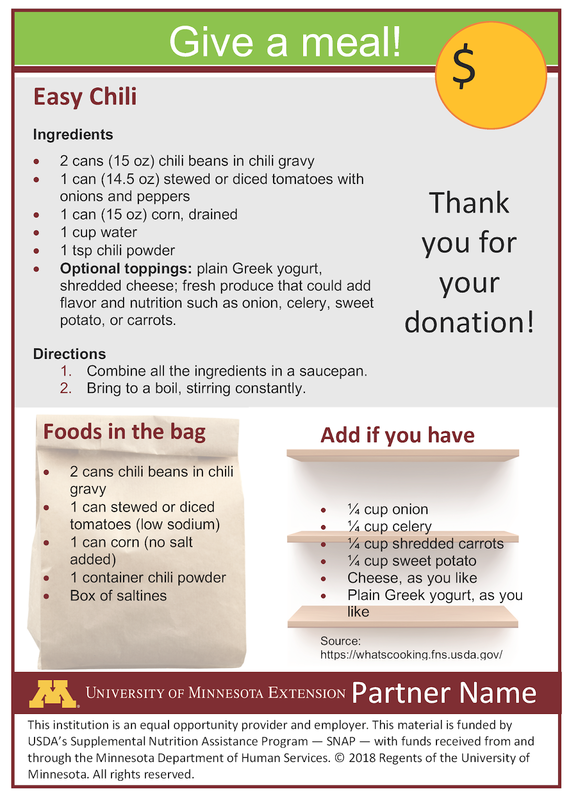 We hope to pilot our first pre-packaged bag called Give a Meal featuring an easy chili recipe. Stores will gather the food items specific to the recipe and put in the Give a Meal bag. People often want to provide meals to those in need in their community. Give a Meal makes it easy for people to make a healthy food donation to their food shelf. Shoppers can buy the pre-packed bag and leave it at the store to be donated to their local food shelf. Shelf stable food items and spices are included in the bag. The meal can be enhanced with perishable items from the food shelf, such as fresh produce or dairy items, if available. A local food shelf has been giving our team ideas on what they would like donated. Our next bag will be a kitchen starter kit featuring the basic necessities needed to do more home cooking. Check out the food shelf resources available! This workshop is designed for all volunteers and staff working directly with clients at food shelves. Participants will learn how good nutrition leads to good health using MyPlate, examine ways to nudge clients to make healthier choices and identify how food shelves can make low cost or no cost changes that make healthy foods more desirable. The audience for this presentation is food shelf boards or advisory committees, volunteers and staff interested in learning more about the workshops, presentations and resources the University of Minnesota Extension and SNAP-Ed offer to food shelves throughout Minnesota. This presentation and guided discussion is designed for food shelf boards and advisory committees exploring the client choice model for food shelves. Food shelf volunteers, directors and board members from across Minnesota are featured in the videos. They share challenges, tips and tools for going to client choice. Food Shelf Resource Book, includes food cards containing information about more than 90 food items, their health benefits and easy ideas on how to use the food. Also included are food group information sheets, produce freezing and storage guidelines, and recipes. This workshop is for staff and volunteers at food shelves with commercial, licensed kitchens. The workshop provides information on how to safely and effectively implement food sampling and food demonstrations at the food shelf to influence healthy food choices by patrons.